The Golfo Dulce was a big mirror of crimson as the morning fireball rises over the mountains of Panama and painted the sky like a beautiful canvas. The only sounds were the jungle behind Puntarenitas slowly coming awake, the soft slapping on the shoreline of gentle waves and the gurgling of a top-water popping lure being worked by an 13 year old boy. The serenity of this setting is cheerfully interrupted when a 25 lb roosterfish crashes the lure and it is game on. Tosh Craig pulled in this big one from the shore line. I grew up in a small fishing community in Florida very much like Puerto Jimenez. Miles of isolated beach and mangrove estuary was my playground. Monster snook and baby tarpon were just a cast away. Of course that was 100 years ago and today that stretch of beach is lined with condos. Never in my life, have I had anyone bring back so many childhood memories as when I sat down and had a conversation with (then) 11 year old Tosh Craig. Tosh lives and breathes fishing. From the time he busted out of his walker as a baby, he has been fishing. 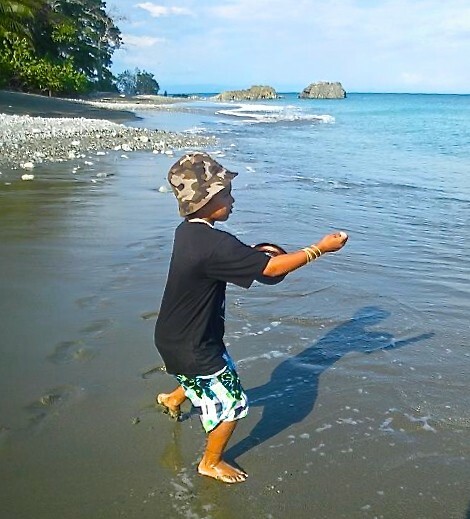 It doesn’t hurt that his father Cory Craig of Tropic Fins is one of the most talented fishing guides in Costa Rica’s Osa Peninsula, but when dad is busy with customers, Tosh goes fishing. He is either on the beach casting the surf break alone or with his fishing buddy Anthony Araya, or you will find him on the public pier in town fishing with the other locals. Over time he has become proficient with handline, spinning, conventional, and fly fishing gear which means he is right at home fishing the style of the “locals,” or next to an adult tourist sporting a $1000 fly rod. The check marks on his bucket list would impress even the most seasoned angler. Sailfish, dorado, tuna, a 40 pound rooster, 20 pound cubera snapper, and a 15 pound Colorado snapper taken on a handline. Next on the bucket list is a marlin. Of the array of species he has tackled, roosterfish is his favorite. Available from a boat or the shoreline, roosterfish are one of the most sought after inshore gamefish Costa Rica has to offer. 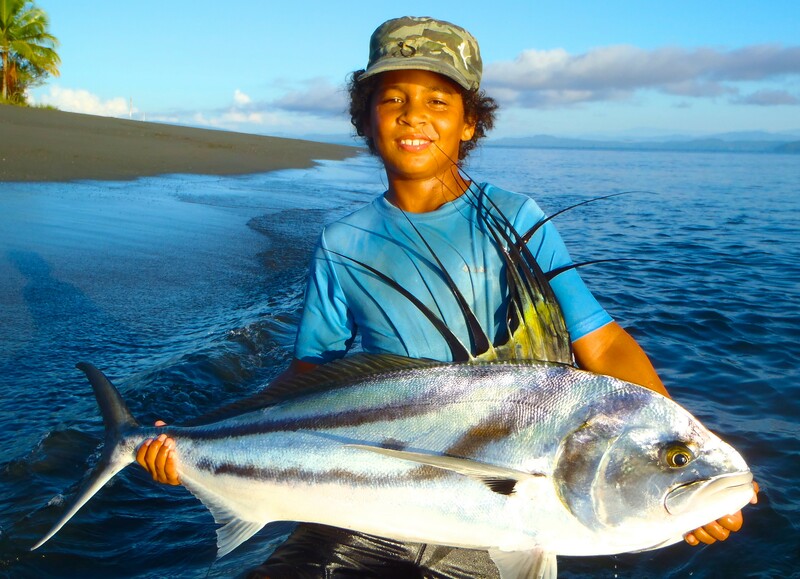 Considered table fare for locals, Tosh chooses to release all the roosterfish he catches. Tosh and Cory are often up before the sun on the beach casting. “My dad likes to fish for snook, but I would rather catch roosterfish,” explained Tosh. “They are stronger and fight better.” His favorite method is to use live bluerunners. He has to catch his own and uses a small white jig and if successful casts his live offering out beyond the surf. If live bait is not available he throws poppers on a handline. A slick surface is preferred and the best opportunity for that is early morning. The fifth grader at Corcovado bilingual school also loves to surf and play guitar. Sounds like a recipe for future lady killer, so mom keep your eyes open. For now the most important thing to him is fishing. Doesn’t matter where or what kind of fish as long as it’s a challenge. His favorite place to fish is the beach in front of his house running to Puntarenitas. His long term goal is to be a fishing Captain like his father. “Really, I just fish whenever I can”. He smiled.